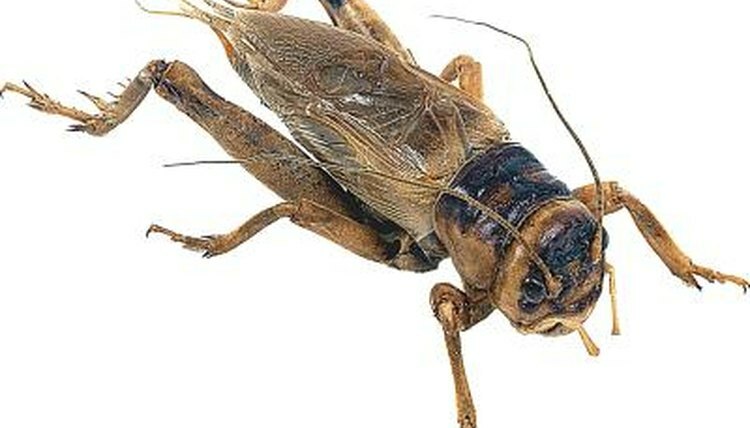 No matter where you live in the United States, muggy summer nights are usually punctuated with the sounds of crickets. Male crickets are the only ones who "sing," rubbing their wings together to make the characteristic chirping sound. Even if you observe a cricket who is not chirping, you can easily tell whether the bug is male or female. The easiest way to tell if a cricket is female is by observing an ovipositer. This is a swordlike tube up to three-quarters of an inch long that protrudes from the end of her abdomen, much like a stinger would. The tube is used exclusively for laying eggs deep in the soil. Both males and females have additional short prongs on each side of the abdomen. Male crickets have shorter, sturdier wings with rough underside surfaces known as file. The top of the wing has a formation known as a scraper. To make his chirping song, the male rubs the scraper of one wing against the file on the underside of the other. The female hears with sound receptors situated on her front legs and responds if she likes the rhythm.